I've made a number of printable Bible Word Search puzzles that you can print out right now. See the list of puzzles below. Word searches are a fun workout for your brain and can also be used as educational aids. 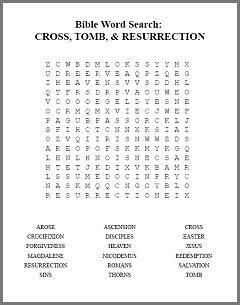 You have my permission to print out the Bible Word searches below for personal, classroom, or church use, or for use anywhere else. Feel free to make as many copies as you need. You can save the pages to your computer and/or share them via email to whomever you like. Basically you can do whatever you want with the word search puzzles except sell them. All I ask is that you keep the copyright notice at the bottom of the puzzle page in place. Are you the publisher of a newsletter, bulletin, newspaper, or magazine? Include a word search in each issue. Your readership will love it! In your publication, simply include the following copyright statement next to the puzzle: "© Memory-Improvement-Tips.com. Reprinted by Permission." By the way, do you know a special needs student who might enjoy solving word search puzzles, such as a child or adult with autism or severe ADHD? Then check out my collection of Special Needs Word Search puzzles, which includes 25 Bible word searches. Also free, of course! For even more word searches, see my Word Search Printables page. Here are the Bible Word Search printable pages. The puzzles cover a variety of topics related to Christianity and the Bible. Many are based on suggestions made by visitors to this page. Click the link to open a printable version of the word search in a new window. For the solutions to these puzzles, scroll down to the Solutions section of this page. The word search pages are in PDF format. Most computers should be able to view and print out these puzzles with no problem. Note: If nothing happens when you click the link, you might need to install free PDF reader software on your computer. This can be found at various places online such as Adobe.com. I've double-checked all the puzzles to make sure all the words are in them. So if you can't find a word, don't give up too soon! These word searches are good puzzles games in their own right, but parents and Sunday School teachers can make use of these puzzles as teaching aids as well. If you are a Sunday School teacher or Vacation Bible School (VBS) instructor, consider using one or more of these printable Bible word searches in your lesson plans. Allow your students five or ten minutes at the beginning of class to work on one of these word searches. 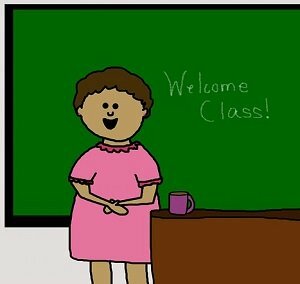 I've taught informal classes at work before. One technique I learned for helping students get their mind in gear to focus on the lesson is to allow them to first work on a puzzle at the beginning of class. This helps them relax and gains their attention. You can even spend a minute or two quizzing the group on their knowledge of the related Bible topic. For instance, if you've given them the Apocryphal Books of the Bible word search, ask the class to explain what those are. Or, if they're working on the Books of the New Testament puzzle, see if any of your students can recite the books of the Bible from memory. By the way, it doesn't matter if all students don't finish the word search in the alotted time. Just allow them to take the puzzle with them after class (but don't allow them to work on it while you are teaching!). They can finish it at home. Parents, too, can use these puzzles to get their children more interested in the Bible. For example, working on the Plagues of Egypt word search naturally makes one wonder about the plagues and may encourage your child to look up or ask about the details. Examining lists of terms from the Bible and then delving into their meanings is a refreshing way to learn more about the Bible. Spend a few minutes on Wikipedia.com looking up the terms in the Mountains of the Bible word search, and you will learn some fascinating facts about the Holy Land and Biblical history. I suppose not everyone has solved a word search before, so here's how to do it. 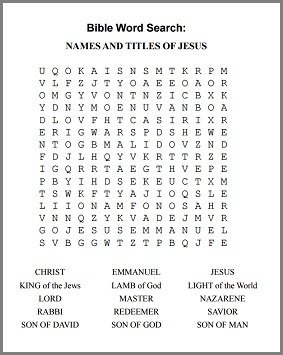 There are a certain number of words hidden in each printable Bible Word Search. The words in each puzzle are listed at the bottom of the puzzle page. Words can be forward, backward, or at a diagonal. When you find a word, circle the word and cross it out from the list. One helpful technique I often use is to search for double-lettered words first. 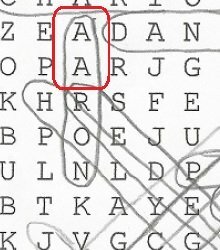 For example, the word Aaron is one of the Bible terms hidden in the Life of Moses word search. Spotting the double "AA" is a quick way to pinpoint the location of that word in the puzzle. Another trick is to begin with words that contain letters of the alphabet that are relatively rare. Letters such as X, Z, Q, etc. should only appear in the word search puzzle a few times, making these letters much easier to find. Need More Printable Bible Word Search Puzzles? If you have an idea for a printable Bible Word Search puzzle, feel free to send me the list of terms and I'll make a puzzle for you for free. Include about 10 to 15 Bible terms, and please provide a title for the word search (for example, "Life of Moses"). Use the form on my Contact Me page to send your request.